Indamira was a Christmas Cybunny of many words. Words that were mostly sarcastic remarks. Harsh, yes, but that happened to be who she was—she couldn't help it if she tried, and if she did try, the world would probably explode from the effort. This morning she woke up late and still very much tired, and wanted nothing more than to have peace and quiet while she munched on the same breakfast food she had every morning—an omelette with a side of half-jelly. It seemed, though, once her sister arrived, she was not going to get that at all. "Indamiraaaa!" Samii, a starry Xweetok, gushed. She skipped over to the table Indamira was sitting at, smiling ecstatically, and Indamira could already feel her brain cells turning to mush. Did she mention Samii was a bit of an airhead? No? Well, in this Cybunny's professional opinion, Samii was a prize-worthy airhead, sought after by science to study how one could survive without a brain. Sadly that day had not come yet, and here Indamira was, stuck with the blabbermouth for who knew how long. "So did you hear? Aunty sent a bunch of stuff in the mail and we get to open it all up once everyone wakes up! Isn't that great? I wonder what Aunty Liz got us—do you think she got those Lupe treats Retrik likes? Oh he would just love her forever and ever if she did—" And as she rattled and rattled off, Indamira tried to breathe in slowly, tried to keep her sarcasm to herself, tried not to generally explode on her, but failed. Miserably. "Oh my gosh, Samii, don't you have friends to bug instead of me? I really want to be alone right now!" That stopped the Xweetok right in her tracks. To Indamira, that was a job well done, deserving of a medal. However, Samii didn't seem finished yet. "But... all of you are my friends!" she said, somewhat confused, but again happy as she waved her hands around to emphasize 'all of you'. "How about a best friend, huh?" Indamira countered, feeling her voice rasp a little. She took a sip of her water as Samii pondered the words. "Well, uh, a lot of people are my best friends—"
"It doesn't?" That really got her confused. Indamira decided to roll with it, if only to get her out of her hair. "Nope. Family is family. They have to be your best friends," she said, keeping her gaze away from Samii. Samii raised her arms so they were resting on the table, and gazed near Indamira, deep in thought. "Well, uh... What about Maggie—"
"TJ is too cool for you, dunce." Indamira sipped at her water some more. Samii pursed her lips, laying her head on the table. Her ears flopped a bit in odd positions, but she paid it no attention. "Welll... what about Jaws and Viepe? They're best friends." "So? Siblings. They only stand each other more than anyone else." "Wow! I never knew friendship was so complicated!" Not to mention she was totally making this up as she went along, Indamira mused. "Well, do you even have any friends?" "...What about Roxa?" Samii asked, eyes suddenly widening. "Yeah! Roxa's like, a really good friend—"
"But is she your best friend?" Indamira asked, briefly rubbing some sleep from her eyes. "How often do you even see her?" Samii frowned. "Uh, last I saw her was two weeks ago..."
"Nope. You see a best friend every day. Proven fact." "Woooow." Samii was looking at her with general awe. Had she been feeling like having her ego boosted, Indamira would have reveled in it, but she did not feel like that at the moment. She dreadfully wished to be alone. "So you have no best friend. You gotta have a best friend. You gotta." The Xweetok mulled it over. "You gootttaaaa..."
"Yup. Or else the friend police come." Samii's eyebrows scrunched up in confusion. "Friend police? Never heard of 'em!" Indamira silently cursed her big mouth, but on the outside feigned shock. She placed a hand over her mouth as she mock-gasped. "You don't know about the friend police?" Ears flopping down, Samii slumped back with fear. "N-no... Uh, should I...?" "Yes! The friend police come to whoever has no friends and—and—oh, I can't even think about it—"
"What? What do they do?!" "They put you in a room with a bunch of people who are delinquents and tell you to make friends with them, or else you'll stay in there." Indamira got up in Samii's face, staring her in the eye. "FOREVER." Samii's teeth were chattering now. "Forever? DELINQUENTS? I don't want to be in a room with delinquents forever! Mama would—Mama wouldn't let that happen at all!" "She would," the Cybunny said, sipping at her drink casually. "It's in the terms of agreement all the owners sign, and I quote: 'if your neopet does not have a best friend, don't worry! We'll find them a friend by forcibly sticking them in a room with a bunch of other pets like them until they make friends! Though many may be antisocial delinquents. Nothing like pressure to make lasting friendships!'" "Good Fyora," Samii said, practically shaking with fear. "I gotta find a best friend!" Then she ran out of the room, screaming, shouting at KT that she'd be back once she made a new friend, to which KT was like "Oh okay be back in time for dinner we're gonna go out for pizza." A best friend. A best friend was one of the best friends a person could have. And, if Indamira was right, all the people she thought were her best friends didn't count as best friends because she was related to them! (Except for Roxa, but she didn't see her often enough to be best friends!) Phooey! ...TINY ROOM WITH DELINQUENTS FOREVER GAH NO NO NO. Samii tried to shake her thought process out of her head. She failed. She grimaced, trying to think happy thoughts, but really, really couldn't. Maybe she and Roxa could become best friends. Spend every day together. She wouldn't mind, Roxa was a really cool person who she could fight in the petpet battledome with if she wanted to. Which they did often. Training or something. But the purple Tuskaninny Roxalia was taking a vacation to Maraqua for the next two weeks, and Samii wouldn't be able to get together with her even if she went to Maraqua (something about needing personal time, or something). And the friend police could come at any moment, right? She didn't have time to wait. So that went down the drain. The starry Xweetok started to wander aimlessly around Neopia Central, wondering what she was even doing for a moment, before she found a lone yellow Lenny carrying some groceries and looking at a list. Samii decided to make her move. "Hi!" she shouted, getting in the Lenny's personal space. He shrieked, surprised, and nearly dropped all his groceries. "What in all of Neopia—"
"My name's Samii wanna be best friends?!" The Lenny stared at her. Then he twitched his eye a bit, giving her a longer, odder stare. Samii's jaw dropped. Before she could say anything more, though, the Lenny picked up whatever remnants of groceries he had dropped and scurried away as fast as his feet could carry him, giving her a creeped-out glance or two as he did. Samii snapped in dismay, scowling. Well, that didn't work. Head low, along with her spirits, Samii wandered around some more, searching for a new target. She caught sight of a speckled Blumaroo—oh goody! Blumaroos loved talking, right? And so did she! They could easily be best friends! As happily as ever, she skipped over to the Blumaroo, who had been looking at some stained glass windows in a shop—oh, had she wandered into the marketplace? Samii dismissed it and put on her best smile. "Hiiii!" The Blumaroo turned her head and looked at her, then smiled as well. "Hiiii! Can I help you?" "My name's Samii and I'm looking for a best friend! Wanna be my best friend? We can talk and talk and go out to eat and have lots of fun times together!" The Blumaroo blinked, a little confused, and said, "You don't just randomly go around looking for a best friend!" "But—you don't?" Why did everything have to be so confusing? "Nooo! Of course not! You have to find someone you have a lot in common with, hang out with them a lot, and then you eventually become best friends!" she explained. "You don't just go up and ask a stranger to be your best friend." "But... friend police!" Samii whined, pitifully, her ears flopping down to match her dismay. The Blumaroo looked confused at that. "Friend police? What's a friend police?" "They're the guys who come and take away neopets who don't have best friends and stick them in rooms full of delinquents until they make friends or else they'll stay in there FOREVER!!" Samii said, in near hysterics. A long gaze from the Blumaroo followed, until she snorted, then giggled, then laughed, then full on started chortling her guts out. Samii felt a tad embarrassed, but mostly like the Blumaroo was being rood. Rude. Bleh. Puns. "Whoever told you that was making stuff up! That's a ton of baloney!" the Blumaroo said, wiping a tear from her eye. "There's no such thing as friend police!" "There is too! Indamira said so!" "Hold up, lemme finish. 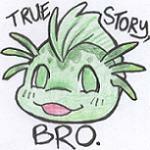 There's no such thing as friend police because..." The Blumaroo waved a finger at Samii, ushering her forward, then whispered, "Because there is the friendship monarchy guild, that sends out random Neopians to make friends with complete strangers, so no one is friendless!" Samii, expression incredulous, moved her head back and gave the Blumaroo a long, hard stare. "...Now I know that doesn't exist." "It does!" the Blumaroo insisted. "Sure, it's not that old, practically newborn, but new members are joining all the time!" "Riiiiight." Maybe this wasn't the best target. "I think I'll just... go over there." Samii left the Blumaroo to her own devices. The Blumaroo just shrugged, and went back to her stained glass window-looking. She mingled around the marketplace, catching sight of potential targets but finding that they either already had people that looked like their best friends, or, looked quite too antisocial and would probably be picked up by the friend police any day now. Samii sniffed, rubbing her nose a bit, and briefly wondered where she could find a tissue, before hopping into a small store manned by a little blue Shoyru. "Hello!" the Shoyru said happily. "Welcome to the Imporium of Stuff! Can I interest you in some toys? All plushies are half off!" She gazed at the toys that were on display. The plushies that were apparently half off were the little cheap ones, mostly ones she or one of her siblings already had, and wondered briefly if a newbie would be in here any moment to buy some of the 'great deals!'. "Nah, not at the moment," she chirped, rubbing her nose a little more. "Do you have a tissue?" Happy demeanor diminishing some, the Shoyru rummaged through a box before pulling out a tissue and handing it to Samii. "Thanks," she said, taking it and wiping her nose. "You're welcome, I guess," the Shoyru said, slumping over the counter and resting his head on his hand. "You sure you don't want to buy anything?" "Well... No one's birthday who I know about is coming up, and I don't really have much of an allowance anymore, so I don't really feel like spending much at the moment! Sorry." "No, it's okay, just... feel free to browse around?" Samii walked around, spying some gardening plants and an ultra fashionable potato sack. She pondered a bit, remembering how lonesome the Shoyru seemed, and instantly knew who her next target was. "Hey, mister?" she asked, turning around. The Shoyru looked up from the counter, briefly excited, and smiled. "How much stuff do you have here? Huh?" A little taken back, but smiling nonetheless, the Shoyru began a long, long explanation. "Oh, many many items! We have a whole section dedicated to petpets toward the back—want a doglefox? We got plenty! And slorgs—we got slorgs too. 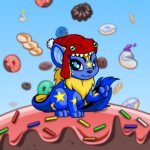 If you look over there we even have a petpet paintbrush! The first of many to arrive shortly, very cheap too. If you're looking to buy anything you better buy soon—people will definitely be coming in by the dozens once they see all the great deals we have here at the Imporium of Stuff, I just know it!" Samii caught the slightest feeling that this shop was the Shoyru's life. "Man, that sounds amazing. Can I ask you a question?" "You just did. But, sure." "Are you in search of a best friend?" The Shoyru gazed at her for a moment, lips pursed, before saying, slowly, "I have a few friends, but I haven't seen them lately, and I don't need a best friend... I have my shop!" Hm. Maybe he wasn't the best target. He would do for now, time was ticking away. "But you can't talk to your shop! Me, you can talk to people like me! And—and we can go do stuff, like buy things! For your shop!" "I'd rather restock by myself, thanks." "Oh come on! Companionship is great! Haven't you heard the saying, 'friendship is magic'?" The Shoyru looked increasingly angry. "If you say that again I'm kicking you out." "What?" She really didn't get why he was angry all of a sudden. "All I said was friendship was ma—"
"That! That! Don't say that! My Little Uni is so lame and boring! Don't even think about it." She had not connected it to My Little Uni. But. Uh. Whatever. "Sooooo... what do you like to do?" "Not be pestered by annoying little Xweetoks." The Shoyru was suddenly hostile. Samii had no clue why. Maybe she did talk too much... "Other than that, I like to run this shop. Now you gonna buy something or what?" "Do you like snow?" Samii asked, back at the counter and smiling as bright as a million suns put together. "I love the snow! Snow is so soft and pretty and you can make snowballs and snowmen and go sledding!" "I don't like the snow." "What! How can you even be living if you hate the snow?" "I have a heartbeat, for one." "Haha! Oh, you're so funny!" Samii giggled, putting a paw on her chest as she did. "Say, wanna be best friends?" "No," the Shoyru said, pouting. "Are you going to leave soon?" "Not until you say we're gonna be best friends!" "I shouldn't have come into work today... "
"Oh, you are hilarious! See? You're funny, I laugh at your jokes, we'll make awesome best friends!" The Xweetok was almost bouncing with excitement, unable to keep a smile off her face. Yay friends! "Just go away," the Shoyru said, moving toward the register. "I'm busy attending to customers." Not to mention there wasn't a single customer in sight. Samii frowned briefly, but her smile quickly returned. "Aw, come on! I won't take long! Just come hang at my place tomorrow?" The Shoyru shook his head. "I have work tomorrow." "I have family to be with." "I can come to your place?" The Shoyru slammed his hands on the counter. "Will you just buy something and go?!" "If I buy something from your shop, will you be my best friend?" "Sure! Whatever! Please just—just buy something!" "Will do, new best friend!" Samii said, closing her eyes and smiling widely. She reached for her neopoints and, finally, remembered that she hadn't brought any. She looked at where her neopoints would have been, then smiled sheepishly back at the Shoyru. "Uuuuh... Do you take IOUs?" Suddenly she found herself thrown out of the shop, face skidding into the dirt floor, while the Shoyru shouted "AND STAY OUT!" punctuated by a door slamming. KT was just about to open the packages sent by her sister when Retrik, a split Lupe, popped up near her leg and asked, "Hey hey hey where'd Samii go we can't open it without Samii!" All the others were ushered away, told to come back when Samii returned. "But Mamaaa!" Jaws, a red Jetsam, whined, "That could take forever!" "Oh, have some patience, Jaws!" Viepe, a blue Zafara lectured. "It's good character development." The door opened and slammed closed in under two seconds. KT looked up, surprised, and found Samii slumping against the door, looking oddly dejected and out of character. "Hey, Samii, what's up?" she asked, setting the mail down on the small table near the door. "No one wants to be my friend!" she shouted, dramatically, head slouching on her shoulder. "They all think I'm weird and annoying!" Now that was the first KT had been told of this. "What? Why do you need new friends? Surely you socialize enough for one neopet..."
"But I need a best friend! And a best friend can't be related to me and I have to see them every day!" she wailed, moaning a little as well. "Now who told you that, huh?" "Indamira! She said if I didn't have a best friend, the friend police would come and stick me in a small dark room with delinquents forever and you'd be okay with it because you okay'd it in those term thingies you signed!" KT shook her head, laughing silently. Ah, Indamira, what an imagination she denied having... KT crouched down to Samii's level and placed a hand on her starry shoulder. "That's baloney and you know it. Indamira was just trying to get you to go away so she could have the peace and quiet she wanted." Samii pursed her lips. "Sooo... I'm not going to get taken by the friend police?" "If they existed, I would have been taken years ago, Samii." They chuckled. Samii rubbed her face a bit, smiling. "Besides," she continued, "sappy as it is, you're definitely one of my best friends." The hug KT got for that remark nearly broke her windpipe. And her spine. And maybe her pancreas too. But it was totally worth it. Just a few million more.